Preheat the oven to 350 degrees F. Grease four 5-1/2″ x 3″-inch mini loaf pans. Using a stand or electric mixer (or mix by hand) cream butter and sugar. Then add eggs and continue to beat until combined, scraping down the sides of the bowl. Add vanilla extract, mashed bananas, buttermilk and beat until well blended. Add flour, baking powder, baking soda and salt. Mix until just moistened. Fold in chocolate chunks. Divide the batter among four mini loaf pans, about 2/3 full. Sprinkle the top with sliced almonds. Place the four mini loaf pans onto a baking sheet and bake for 30-33 minutes or until the tester/toothpick inserted into the center comes out clean. Let the mini loaves cool completely on a cooling rack before cutting into them. I always end up with bananas left over that I scramble to find something to do with – this is a great idea. Thank you! Without the sliced almonds this would still be tasty, but ordinary. The almonds gives it a nice texture balance. This is a winner! I guess I’ve been doing one too many. 🙂 Need to switch things up. Thanks Massi for taking the time to comment. 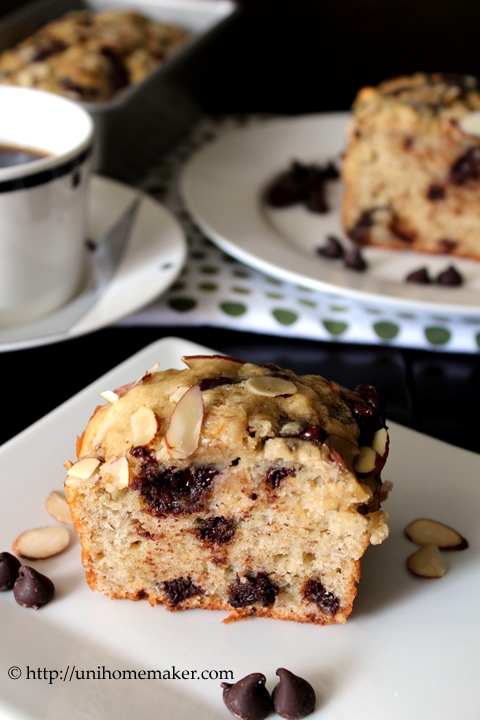 Although I don’t love to eat plain ol’ bananas, I LOVE them baked into breads and muffins and get excited when I find new recipes for them—these sound fantastic! And your photos are beautiful! I”m amazed this recipe makes 4 mini loaves, which means there is only 1 tbsp of butter per loaf. this is totally up my alley, healthy and delicious! Yay, healthy is always good! 🙂 Thanks for taking the time to stop by. Absolutely love those mini loaf tins. 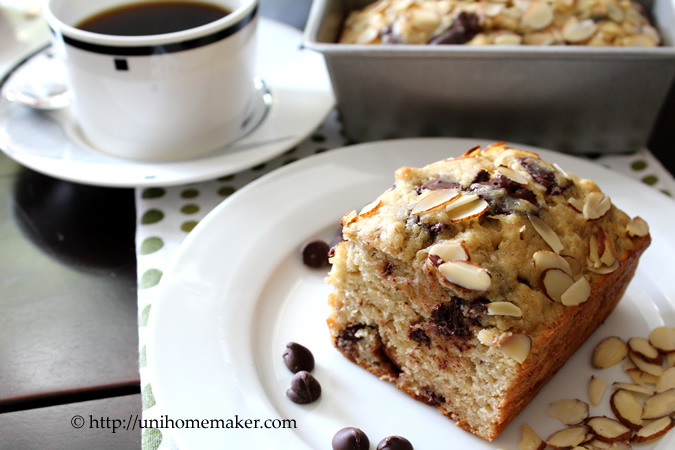 I’m hoping to be baking banana bread tomorrow – ouch! Hope it turn out as good as yours. Although I’m still taking new photos of the cauli and swede soup so the bread may have to wait. Yay –can’t wait to see that post on banana bread. 🙂 Have a great weekend! Your mini loaves look moist and delicious! Love the addition of almonds on top. Love all the photos, so pretty! You’re so sweet Kelly, thank you for your lovely comment. 🙂 Have a great weekend! That looks great – I’m making banana bread now. Too bad I didn’t see this before I started! haha… I’ve been on a banana baking binge as well. So far I’ve made 3 banana desserts in one month. Obsessed much? I made something very similar to this last week. My neighbour’s kids loved it. Never fail when there is chocolate and banana in the mix. I would love to sit down to this! Personally, I never get tired of baking, smelling, eating, seeing banana bread. I love to make them small and give them out as gifts or freeze a couple for later. Plus, I love chocolate banana bread. Those Scharffen Berger chunks must be sooo good in yours! 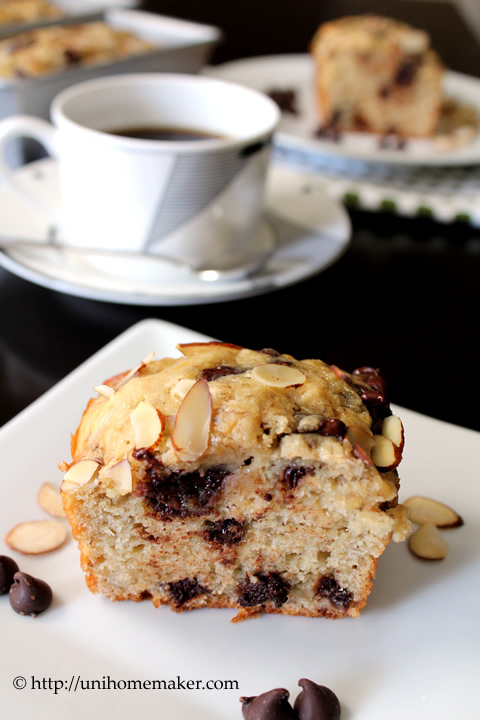 Love the touch of almonds on top! Thanks Monica for that lovely comment! 🙂 Hope you had a stellar weekend. I love that these have almonds on the top. Yum. I always have bananas that need using up! You’ve fulfilled all my banana cravings! I could go for a slice right now, toasted and warm to go with my morning cup of coffee! Those loaves look so delicious!!! They look excellent. Wish I had one with my coffee right now. You don’t have to stop with the banana recipes! 🙂 I LOVE banana bread, pudding, smoothies, ect. Life just tastes better with bananas! These loaves look adorable and delicious, am going to try these soon! Yummy! Love those cute little tins and the addition of flaked almonds. Great recipe Anne. 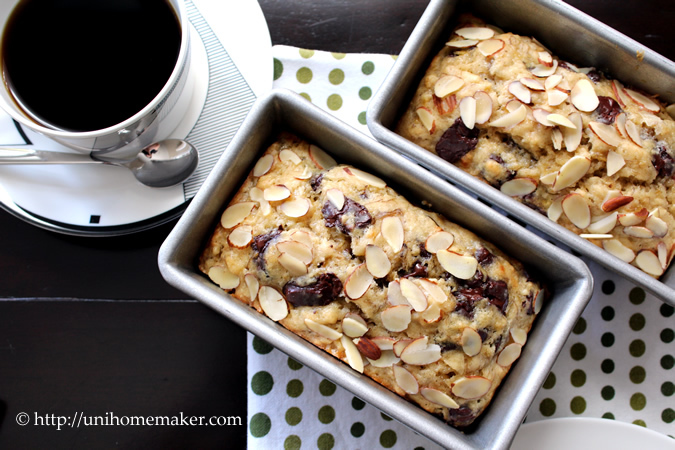 I love the sliced almonds on top of these … and they’re so freakin cute! I don’t know what it is about mini loaves but I love they way they look! Oh my, Anne! These are not only mouth watering …but gorgeous! Pinning! Haha, it was hard, but we shared it regardless. 🙂 Thanks for taking the time to comment Kiran. I am in love with the combination of banana and chocolate. These are adorable, Anne! These little loaves look perfect!!! Banana and chocolate are a perfect pairing! What cute loaves! Don’t promise things like that- I love banana. Anything with banana AND chocolate?! Well, you just hit gold! !